US Person is found of animal rediscovery stories because the contain a ray of hope for animal species facing extinction at the hands of man, and because they demonstrate that man does not know everything there is to know about Nature. The 'awesomeness' of discovery still survives in the 21st century. So goes the story of the Crest-tail Mulgara, Dasycercus cristicauda, a small marsupial that once inhabited the inland sandy deserts of Australia. Introduced predators such as foxes (for hunting) and cats (for rodent control) played havoc with the tiny carnivore. It was known to science only from its fossilized bone fragments--that is until now. Researchers from the University of New South Wales located a specimen living in Sturt National Park, northwest of Tibooburra, NSW. The Park contains a variety of rugged landscapes and is noted for its rich Aboriginal heritage. The research team is part of a collaborative effort, Wild Deserts, to restore, protect and preserve desert ecosystems. Wild Deserts plans to introduce seven locally extinct mammals to New South Wales, after rabbits, cats and foxes are eradicated from two 20 sq. kilometer enclosures. Greater Bilby, Burrowing Bettong, Western Quoll and Western Barred Bandicoot are among the species to be re-established. 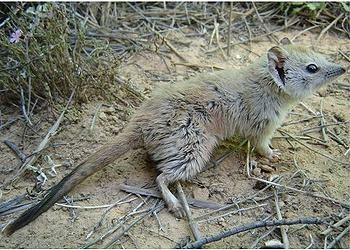 The mulgara is rat-sized, weighing about 150 grams with thick, blond fur and a distinctive black crest on its tail [photo credit: UNSW]. Previous investigation indicates that the mulgara population is increasing in the Strzelecki Desert of neighboring South Australia. Reduced rabbit populations during the past 20 years due to release of rabbit calicivirus is thought to have benefited the species by leading to increases in ground cover.